Riviera is a recent spin-off from Linn Energy. It is executing well but has been ignored by sell-side analysts and institutional investors as it trades over the counter. Company is aggressively buying back stock. Has bought back 10% of shares since the spin-off. Could buy back an additional 17% of shares outstanding. Elliott Management, Fir Tree Capital, And York Capital own over 50% of the company, control the board of directors, and are aligned with minority shareholders to maximize value. Current valuation implies up to 88% upside. Riviera Resources (Riviera or OTCQX:RVRA) is an unlevered, orphaned oil and gas spin-off that is trading at a deep discount to its peers. It is covered by zero sell-side analysts and trades over the counter. Once the company grows its midstream business, it will likely be sold or spun-off which will be a major catalyst. 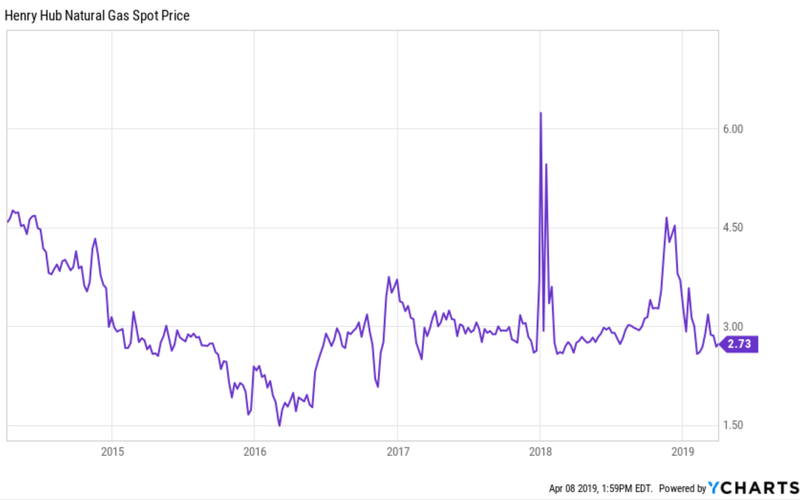 Some of the shrewdest investors in the world own over 50% of the stock, and the company is on track to buy back over 25% of shares outstanding. A conservative valuation implies 30% upside. A more optimistic valuation implies 88%+ upside. Riviera Resources is a spin-off from Linn Energy (LNGG), a post-bankruptcy equity that is trading over-the-counter. Linn Energy emerged from bankruptcy on February 28, 2017, and is majority owned by Linn Energy debtors who bought the debt at distressed valuations prior to the bankruptcy. As shown above, Elliot funds (Elliott Management), Fir Tree Funds, and York Capital Funds own over 50% of company's stock and effectively control the company. Elliot, Fir Tree, and York Capital actually own a higher percentage than is indicated above as RVRA has been buying back stock aggressively in the past 6 months. These shareholders (and board members) have been working aggressively to unlock value at the company as they believe shares are significantly undervalued. In 2017 and 2018, Linn Energy sold $2BN in assets and generated enough in proceeds to repay all debt and repurchase 9% of shares outstanding. On February 27, 2018, Linn Energy announced its plan to split itself into three different publicly traded companies. Ultimately, management and the board of directors decided that the best path forward was to split into two (instead of three) publicly traded companies. "The Board believes the Company trades at a discount to its sum of the parts value and therefore determined to separate the Company into stand-alone publicly traded businesses to unlock such unrealized value." On August 7, 2018, Linn Energy spun off Riviera Resources to its shareholders. RVRA began trading at $23.75 and has declined over the past six months to $14.95. 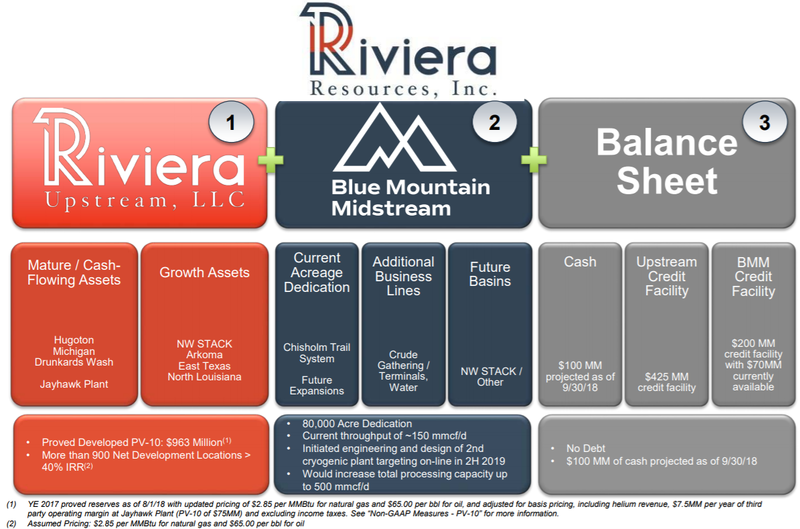 RVRA is comprised of two main assets: Riviera Upstream, LLC and Blue Mountain Midstream. Riviera Upstream owns mature, low-decline assets in Hugoton Basin (Kansas), Michigan/Illinois, Drunkard Wash (Utah). It also owns growth assets in Oklahoma (Northwest STACK and Arkoma STACK), East Texas (Cotton Valley and Bossier Sandstone), and Louisiana (Cotton Valley Sandstones). Riviera Upstream plans to harvest cash flow from mature assets to 1) drill out its growth assets 2) build Blue Mountain's second cryogenic plant (more on that below). Hugoton Basin proved reserves represent ~50% of Riviera's total proved reserves (all proved developed). Riviera also owns and operates the Jayhawk natural gas processing plant in southwest Kansas which has capacity of 450 MMcf/d. Natural gas is delivered to the plant via a system of 3,120 miles of pipeline that is operated by Riviera (the company owns 1,005 miles of the pipeline). In 2018, the Jayhawk plant generated $99MM of revenue. Hugoton Basin produced 138 MMcfe/d of natural gas on average in 2018. It's a very mature field which doesn't require much capital. In 2018, Riviera invested ~$5MM for plant and pipeline construction and develop the properties in the region. Michigan/Illinois proved reserves represent ~14% of Riviera's total proved reserves (all proved developed). Michigan/Illinois produced 28 MMcfe/d of natural gas on average in 2018. It's also a mature field which doesn't require much capital. In 2018, Riviera invested ~$1MM to develop the properties in the region. 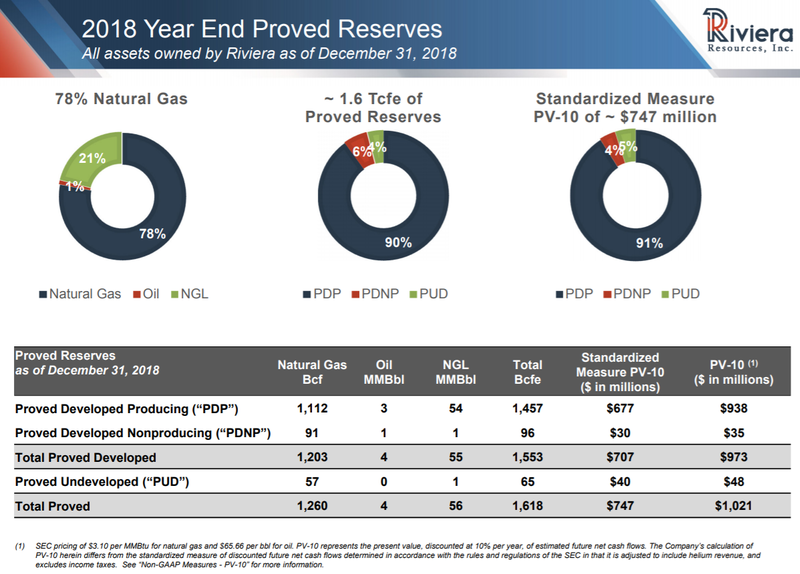 Uinta Basin proved reserves represent ~3% of Riviera's total proved reserves (all proved and developed). The Uinta Basin produces 23 MMcfe/d of natural gas per day. In 2018, Riviera invested ~$4MM to develop the properties in the region. Mid-Continent proved reserves represented approximately 11% of total proved reserves (all proved developed). In 2018, Riviera spent ~$10 million to develop the properties in this region, and ~$15 million on exploration activity. The mid-Continent region produced approximately 53 MMcfe/d in 2018 on average. The Mid-Continent region consists of properties located in the Northwest STACK in northwest Oklahoma and Arkoma STACK in southwestern Oklahoma. East Texas proved reserves represented approximately 17% of total proved reserves (88% are proved developed). This region produced approximately 50 MMcfe/d of production on average in 2018. In 2018, Riviera, invested ~$2MM to develop the properties in this region and ~$2MM in exploration activity. The region produced approximately 26 MMcfe/d on average in 2018. In 2018, Riviera invested ~$2 million to develop the properties in the region. …the flow of the underlying commodity is not nearly as volatile. Further, unless you've been living under a rock, you know that the US production of oil and natural gas has been growing like crazy over the past decade due to fracking and other geological/technical breakthroughs. Despite recent commodity price volatility, this growth is expected to continue and will benefit U.S. midstream energy companies. 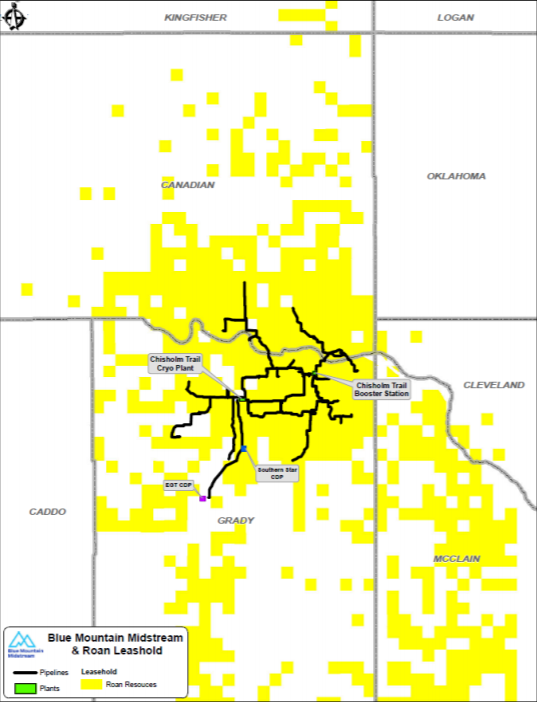 Blue Mountain assets and acreage are located in the Anadarko basin. As you can see in the chart below, the Anadarko basin has been experiencing strong oil and natural gas production growth. In total, Blue Mountain has 80,000 acres which are dedicated to its system. Its pipeline and other facilities serve Roan Resources ("Roan"), its anchor producer. 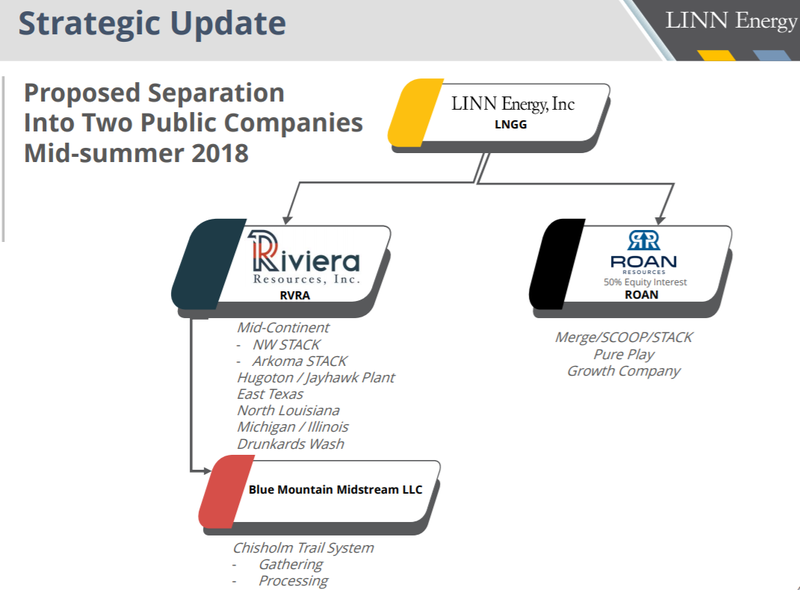 Roan is the Linn Energy Remainco. The chart below overlays Blue Mountain's assets on Roan Resources' leasehold. In Q4 2018, total production grew 110% y/y to 54.1MBoe/d. In 2019, production is expected to grow by 30% (+20% Q4 2019 over Q4 2018). Why will production growth moderate in 2019? 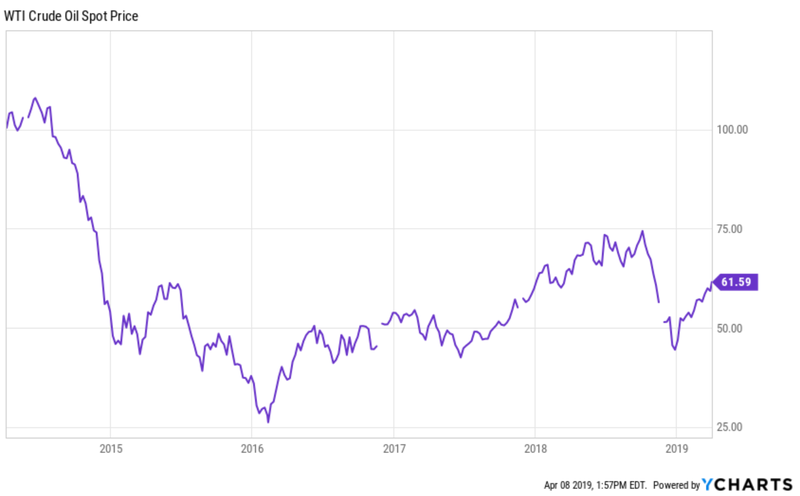 In October 2018, WTI Crude oil peaked at $76.40. Over the next couple of months, it declined 42%, bottoming in late December 2018 at $44.48. While WTI has rallied to $64, Roan nonetheless, decided to moderate its drilling plans so that it could become free cash flow positive by Q4 2019. In Q4 2018, Blue Mountain averaged 132 MMcf/d of gathering volumes, representing 53% of Blue Mountain's current processing capacity. Blue Mountain currently has one cryogenic gas processing plant that can process 250 MMcf/d of gathering volumes. Based on Roan's guidance of 20% production growth in Q4 2019 over Q4 2018, I project that Blue Mountain will be processing 158MMcf/d of gathering volumes in 2019. Roan has indicated that it expects double digit production growth in 2020 (while staying FCF positive). Assuming 10% production growth in 2020, Blue Mountain will be processing 174.2MMcf/d of gather volume. This represents 70% of Blue Mountain's current available capacity. Management has provided guidance that the cryogenic plant would generate $110MM to $125MM ($117.5MM at the midpoint) at full capacity. I could multiply 70% by $117.5MM to get an EBITDA estimate of $82.3MM, but I think this may be optimistic as margins are higher when the plant is operating at full capacity. Thus, I'm going to give that estimate a 30% haircut and assume that the first plant is on track to generate $57.3MM of EBITDA in 2020. Besides this first plant, RVRA recently announced plans to manage all of Roan's water needs for its drilling and completion operations in Central Oklahoma. This is expected to generate ~$19MM (at the midpoint) of EBITDA by 2020. So you add those two contributors together and you get $76.3MM of 2020 EBITDA. Now that we've reviewed RVRA's assets, let's try to value them. Management provided guidance for the upstream business of $95MM in EBITDAX. Subtract $5MM of expected exploration expenses (what was spent in 2018) and you get $90MM for EBITDA guidance. RVRA also disclosed its upstream business had a standardized 2018 PV-10 of $747MM. I adjusted this down to $701MM to reflect an asset sale (RVRA sold Arkoma interest in December 2018 for an EV / PV-10 multiple of 1.11x). As shown below, peers trade at a median EV / PV-10 multiple of 1.11x and a median EV / '19 EBITDA multiple of 4.9x. Assuming a median EV/PV-10 multiple, RVRA upstream is worth $779MM. 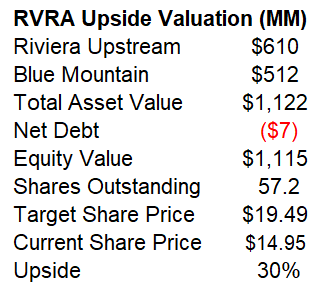 Assuming a median EV/'19 EBITDA multiple, RVRA upstream is worth $441MM. Average the two together, and RVRA upstream is worth $610MM. We established above that our 2020 Blue Mountain EBITDA estimate is $76.3MM. Apply a 6.7x 2020 EV/EBITDA multiple (consistent with valuations of midstream competitors) and you have an implied asset value of $512MM. See below for Blue Mountain's comp group. 1) Midstream valuations are depressed. Typically, the median midstream valuation ranges from 8x to 12x. 2) This EBITDA estimate provides no value to the Blue Mountain's upside optionality. For example, if crude oil rallies by ~$10, Roan's would be more aggressive with its drilling plans. As a result, it would need more capacity at Blue Mountain's first plant and would eventually need a second plant (the second plant has already been designed). If Blue Mountain's first and second plant were operating at full capacity, they would generate $220MM to $250MM of EBITDA. This would be in addition to $19MM that will be generated by providing water services to Roan Resources. 3) Blue Mountain plans to be aggressive in its efforts to diversify its service offerings as evidenced by its recently announced water service agreement with Roan. Blue Mountain plans to continue to offer additional services which will add EBITDA and diversity of earnings. I've valued Riviera Upstream at $610MM and Blue Mountain Midstream (very conservatively) at $510MM. Now let's examine RVRA's balance sheet and potential share repurchases. As of 12/31/2018, RVRA has $6MM of net debt. Early in March 2019, Riviera announced that it had monetized ~55% of its helium reserves for $82MM. Importantly, helium reserves don't count towards the company's SEC standardized PV-10. So my upstream valuation also ignores this asset. Yet, Riviera was able to sell about half of its present value for $82MM! Assuming 5% transaction costs, RVRA received $77.9MM in net proceeds. Pro-forma for this transaction and RVRA has $71.9MM of net cash on its balance sheet. Now let's examine how much cash RVRA will generate and spend in 2019 and 2020. Upstream 2019 EBITDA and capex guidance are $90MM of EBITDA and $66MM. So we can expect $24MM of free cash flow. I'm going to assume a stable environment and that the upstream business also generates $24MM of free cash flow in 2020. While Blue Mountain has not provided guidance yet in 2019, I expect the division to generate $57MM of EBITDA in 2019 and $76.3MM in 2020. Blue Mountain will spend $59MM in capex in 2019 to construct and operate a water management system to execute on its agreement with Roan Resources (RVRA will handle all water needs for Roan). While Blue Mountain will likely have capital expenditures in 2020, no projects have been identified yet (a second cryogenic plant won't be needed until Roan's volumes ramp up significantly). Thus, until a project is identified, I'm going to assume minimal capex ($20MM). RVRA has been a prolific repurchaser of its own shares. It has repurchased over $155MM of stock since the spin-off in August 2018. The company has a remaining share repurchase authorization of $78MM. Because Riviera will have excess cash flow, I assume that RVRA will execute another tender offer to repurchase its shares (it repurchased $133MM of its shares through tender offer in October 2018), this one for $100MM (in its helium monetization press release, the company noted the possibility of a tender offer). In total, I believe RVRA will buy back an additional $178MM of stock at an average price of $15. This would result in 11.9MM (17% of shares outstanding) shares being retired and shares outstanding declining from 69.1MM to 57.2MM. Below I've displayed the sources and uses of cash. The above schedule implies that RVRA will need to take on $4MM of debt, a minimal amount. Riviera has an available credit facility for ~$500MM. Putting it all together, I think the stock is worth $19.49 today. 30% above its current price. See chart below for the full math. 1) This analysis provides no value to Blue Mountain's longer term potential/upside optionality. For instance, let's just assume Roan production volumes ramp up and Blue Mountain's first cryogenic plant has to operate at full capacity. In this scenario, Blue Mountain would generate $117.5MM in EBITDA from processing natural gas and $19MM from its water services for total EBITDA generation of $136.5MM. Assuming the same valuation multiple (6.7x) and Blue Mountain is worth $915MM, almost 100% more than our current valuation. Also, a second plant has already been designed and can be built when needed which results in another leg up in revenue and earnings. Longer term, there is significant upside to my EBITDA estimates. 2) I'm valuing Riviera's upstream assets at a discount to its PV-10 despite 1) the company's historic ability to sell asset at a premium to PV-10 (Arkoma was sold at 1.11x multiple of PV-10). If I were to value the upstream assets at PV-10, they would be worth $701MM, significantly above my current valuation of $611MM. In my upside scenario, the stock could reach $28.13, over 88% upside from current levels. The majority of management was formerly at Linn Energy. This is somewhat concerning as the company went bankrupt. However, in this situation, I'm not particularly concerned. First, it will be a positive to have their institutional knowledge of the former Linn Energy assets. Second, Elliot Funds, FirTree Funds, and York Capital Funds own over 50% of the stock and control the board of directors. Their presence will ensure fiscal discipline. Further, the Chairman of the Board is Evan Lederman, a partner at FirTree and former bankruptcy attorney. David B. Rottino is the President and Chief Executive Officer and as a member of the board of directors, and, since February 2017, has served as Linn Energy, Inc.'s Executive Vice President and Chief Financial Officer and as a member of the LINN Energy board of directors. Mr. Rottino previously served as Linn Energy, LLC's Executive Vice President and Chief Financial Officer from August 2015 to February 2017, as Executive Vice President, Business Development and Chief Accounting Officer from January 2014 to August 2015, as Senior Vice President of Finance, Business Development and Chief Accounting Officer from July 2010 to January 2014, and as Senior Vice President and Chief Accounting Officer from June 2008 to July 2010. Daniel Furbee is the Executive Vice President and Chief Operating Officer, and, since March 2018, has served as Linn Energy, Inc.'s Vice President of Asset and Business Development. Mr. Furbee previously served as Vice President of Business Development and Asset Development for Sanchez Energy Corporation from August 2013 to April 2018. From 2007 to August 2013, Mr. Furbee served in various engineering positions, including most recently as a Senior Staff Engineer-Business Development, at Linn Energy, LLC. James G. Frew is the Executive Vice President and Chief Financial Officer, and, since February 2017, has served as Linn Energy, Inc.'s Vice President, Marketing and Midstream. Previously, from 2014 to February 2017, he served as Linn Energy, LLC's Vice President, Marketing and Midstream. Mr. Frew previously served as Director, Strategy, Planning and Business Development for Linn Energy, LLC from 2011 to 2014. This is a taxable spin-off which means there is no restriction on a company sale (tax-free spin-offs cannot be sold for 2 years). I think ultimately, the company is sold as this is the most efficient way for Elliot Management, Fir Tree Capital, and York Capital to realize their investment. RVRA currently trades over the counter. The board of directors could uplist the stock. This would allow more institutional investors to own the stock. RVRA is trading significantly below my conservative estimate of fair value ($19.49). I believe this is driven by two factors: 1) it is the spin-off of a post-bankruptcy equity and 2) it is trading over-the-counter. However, RVRA's discount to fair value won't last for long. The company is aggressively buying back stock and management is taking steps to increase value. I think ultimately, the company is sold as this is the most efficient way for Elliot Management, Fir Tree Capital, and York Capital to realize their investment. I believe the stock will appreciate over time as more investors discover the name. Roan Resources Production Growth: Roan Resources is Blue Mountain's anchor producer. As such, Blue Mountain is reliant on Roan for production growth. Mitigant: Roan's production grew by over 100% in 2018. While Roan is pulling back on its drilling plans in 2019 due to the decline in the price of oil, the company has limited debt, additional credit capacity, and strong existing production. It should be able to continue to grow production even if oil prices decline to the $50 range. Further, Riviera management and board of directors have intimate knowledge of Roan as it is their parent company. Thus, they have detailed knowledge of Roan's plans, results, and growth prospects. Commodity Prices Decline: This one is obvious, but a commodity price decline would negatively impact cash flow and RVRA's valuation. Mitigant: Riviera's current valuation provides minimal credit for the company's Blue Mountain operation. If commodity prices were to decline, I believe there would be less downside vs. peers due to RVRA's already depressed valuation. Interested in high potential stock spin-offs? Join Stock Spin-off Alpha. For a limited time (through the end of April), I'm offering a 14-day free trial AND a 20% discount for annual subscribers. This works out a monthly cost of $28.25 (paid annually). So, you can try out my service completely free and then if you like it, receive a 20% discount. As a legacy subscriber, your price will never increase. It is locked in for life. Disclosure: I am/we are long RVRA. I wrote this article myself, and it expresses my own opinions. I am not receiving compensation for it (other than from Seeking Alpha). I have no business relationship with any company whose stock is mentioned in this article.